It was relatively early in the Korean War, but it was very nearly the Republic of Korea’s last stand. A ragtag contingent of seventy-one student-soldiers were assigned to hold off the dreaded 766th Regiment at the P’ohang-dong Girl’s Middle School while the beleaguered allies dug in at the Naktong River. They faced Alamo-like prospects, but they were not about to give up without a fight. Brace yourself for the carnage and heroism of John H. Lee’s 71: Into the Fire (trailer here), which screens next week as part of the Washington, DC Korean Cultural Center’s monthly K-Cinema series. Oh Jang-beom saw plenty of action before the South Korea Army was forced to retreat, but he never fired off a shot. Still, Captain Kang Suk-dae appreciates the implications of his experience, so he places Oh in charge of the newly formed student-soldier unit. They are to hold the P’ohang Middle School against the expected Communist onslaught, to prevent the Naktong forces from getting outflanked. To complicate the situation, surly delinquent Gu Kap-jo challenges his authority at every turn. The green recruits under his uncertain command simply have no idea what war entails. Making matters even worse, the ruthless Major Park Moo-rang is leading the drive towards the middle school. Even though he is a true believer, he also happens to be the North’s most capable battlefield commander. Yet, he still finds his orders second-guessed by the regiment’s political officer. 71 opens and closes with massive spectacles of warfighting conflagrations, fitting in several tense skirmishes in between. This is the sort of film that can give you a concussion. Lee is clearly not fooling around with a lot of phony melodrama. While Park Jin-hee (the court nurse in Shadows in the Palace) briefly appears as a compassionate military RN, most of the film revolves around shooting at the enemy. War is definitely Hell in 71, but the film’s sympathies are clearly with the ROK. Despite Park’s professed desire for unification, his ideals are constantly undermined by cruel and craven political officer. While many of the seventy-one student-soldiers blend together, K-pop rapper T.O.P. (a.k.a. Choi Seung-hyun) manages to project a slow-burning intensity above all the explosive bedlam surrounding him. It is a dynamite screen debut that deservedly racked up a number of Korean popular choice film awards. Frankly, he barely looks like he is out of middle school himself, which lends the film further authenticity and poignancy. 71 was definitely his coming out party, albeit one produced with the cooperation of the Korean Defense Ministry and released to coincide with the 60th anniversary of the start of the Korean War. Nevertheless, Cha Seung-won’s Park vividly personifies condescending arrogance, while as Kang, Kim Seung-woo anchors the film with steely gravitas. Without a doubt, 71 is one of the best produced war films of recent vintage, ranking just below My Way and considerably above Fury and The Front Line. It is viscerally immersive, but T.O.P., Kim, and even Park Jin-hee maintain a strong human connection. 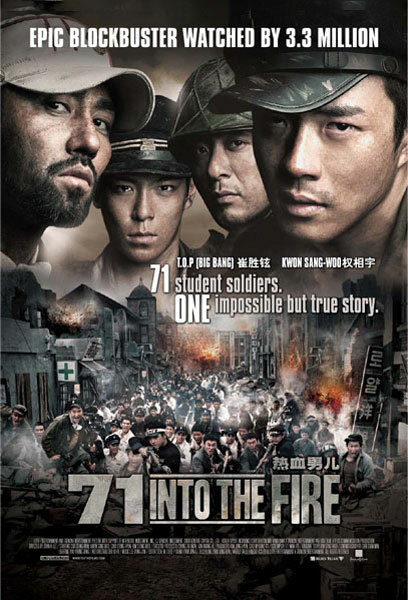 Recommended for mainstream war movie audiences, 71: Into the Fire screens this coming Thursday (8/27) at the Korean Cultural Center in DC.